#603 "Spider-Man, Saving the Superhero Movie"
Screenwriter David Goyer talks about sending Batman back to his noir origins in the upcoming Batman Begins. Blockbusters like X2: X-Men United and Spider-Man 2 prove that superhero movies can triumph, so why do so many others go wrong? Rod Serling’s brainchild returns, only this time it’s what you can’t see that thrills you in the radio-play version of The Twilight Zone. Adapting fantasy author George R.R. Martin’s The Hedge Knight might be the key to success for an up-and-coming comics company. The award-winnning author of Lord Valentine’s Castle reflects on fifty years of writing science fiction. A look back at some influential movies, magazines, books, comic books, and TV from the first half of the twentieth century. A brief chat with the creator of the Ringworld and Known Space stories. PLUS FOUR ALL-NEW SHORT STORIES! Back in the days of Hugo Gernsback, writers often created stories based on illustrations rather than the other way around. In that grand tradition, we’ve showed some of our favorite authors a picture, and they’ve showed us just which thousand words it paints. 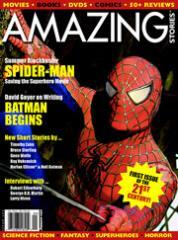 More than 50 reviews of the latest books, movies, DVDs, and comics! News and previews from the world of SF, fantasy, and supernatural horror! Comic strips, crossword, and your letters!